AMEN, and thank you Father. Prof. Mattei, The Second Vatican Council (an unwritten story) pp, 95, 96 observes that he and Cardinal Ruffini were both in favor of V2, and when the great Roman broached the idea with Pope Pius XII on March, 4, 1948, he saw it as a necessary to address matters as serious, substantial, and as numerous and as that which was addressed by Trent. After the election of Pope John 23rd, Ottaviani and Ruffini went to his cell at the conclave and suggested he convene V2. Many Trads seem to be of the impression V2 had no justification for being called - but, there is a world of difference between the necessity of that Council and how it proceeded once the revolutionaries gained control. It is refreshing and encouraging to read praise for the words of Pope Francis on these matters. Thanks for this post Father. "March 15 1948" - this Council was prompted by the occupation of Italy and was payback for the debt relief gained by Di Gasperi. The movers and shakers at the council were all from occupied countries. In some cases the countries had been bombed to bits. 100,000 women in Berlin alone had already been raped by "March 15 1948". 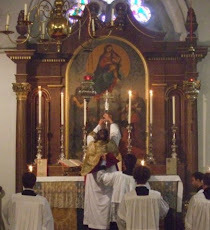 Traditionalists want it both ways: WWII victory at any cost and the Latin Mass. God's Holy Spirit, in his infinite wisdom, has ordained otherwise. Praise the Lord!